A.S. Swanski‘s dark electronic music asks questions of it’s listeners rather than simply delivering ear candy, which it also does in spades. Intellectually stimulating, much like J.G. Thirwell’s work with Foetus and Manorexia, Swanski pays respect to his early industrial and post-punk influences, keeping the mood ominous and foreboding. I dig very much. 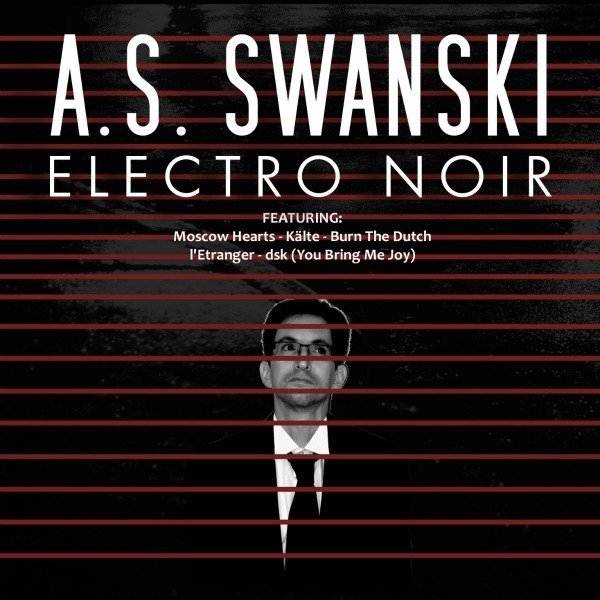 The music is intense enough that, although it may fit as well as Pink Floyd’s “Dark Side of the Moon” synced with “Alice in Wonderland”, I wouldn’t want to see A.S. Swanski’s new album “Electro Noir” synced with “Eraserhead”. I’m well aware that I just put an idea in your head there! “Moscow Hearts” is needy and confused, with A.S. Swanski’s raspy whispers trading off with a Portishead-style female melodic vocal. The beat and bassline drive the mood forward, and it’s a menacing one to be sure. This is sombre electronic melancholy at it’s best. What perhaps sets Swanski’s work apart from his contemporaries is his minimalist approach and sense of space. Rather than fill the mix with glitchy effects and syncopated noise, Swanski prefers for each element to mean something, much like Portishead, who put much effort into the small details – playing a piano part a certain way or leaving a beat beautifully basic. That’s what is achieved here. “Therapie” is wonderfully creepy, especially at the enlightenment point of the song where the instructions are “Give me your Hand”. Other highlights from the release include dsk (You Bring Me Joy), which sounds like a descent into madness, and “Burn the Dutch”, which continues the journey, but it’s strangely enjoyable to be along for the ride. Check out the brilliant video for “Moscow Hearts” below. For a free download of “Moscow Hearts”, go here.